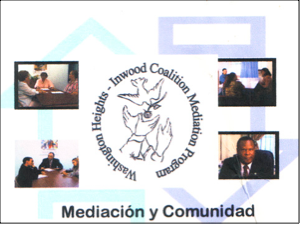 Washington Heights Inwood Coalition Mediation Program released a free Peer Mediation Training Manual in Spanish. Includes a peer mediation role-play video. The Washington Heights Inwood Coalition, closed in 2016, was established in 1978 by religious, educational, and business institutions reflecting the diversity of northern Manhattan, New York. The Coalition addressed issues of concern to member institutions. Thier broad-based programs improved the day to day lives of local residents, filled service gaps, and built understanding among the many communities making up Washington Heights-Inwood. Their services include the provision of mediation to community members and hosting of conflict resolution programs in local schools as well as a range of after school programming options. All of their program staff were bilingual in spanish and english. See our Spanish Language Peer Mediation Training Manual here - produced with the support of the JAMS foundation. Also available is a Spanish Language peer mediation training video.